A blog from Tim Worstall at the Adam Smith Institute claims bizarrely that the way to cut unemployment is to cut unemployment benefits. That’s like blaming hospitals for broken legs – though I suppose that if there weren’t as many hospitals we’d not get to count the broken legs quite so thoroughly. 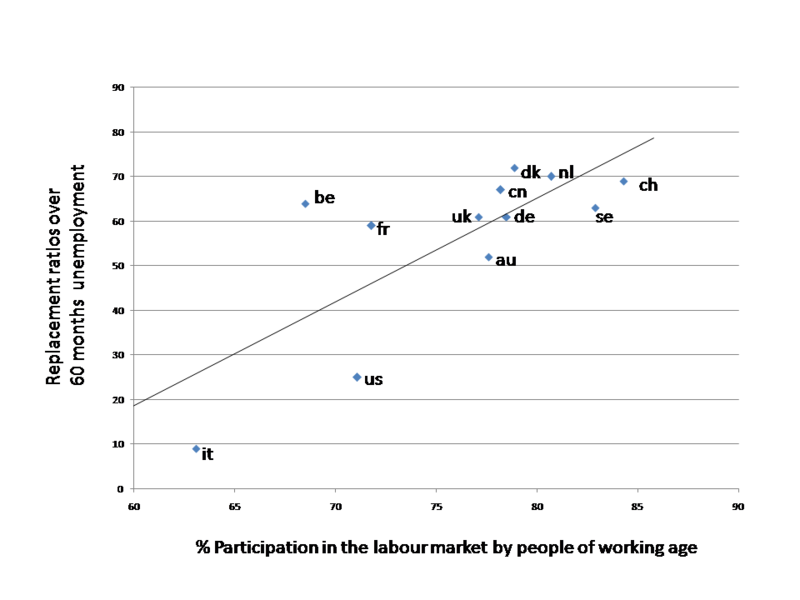 I threw together this graph fairly rapidly from OECD figures I had to hand: the axis on the left shows replacement ratios (how much unemployment benefits replace of salary during the first 60 months, assuming housing costs are allowed for), the bottom axis shows labour market participation, the points on the graph are all major OECD countries. If there is a relationship, it’s in the opposite direction to the claim made by the Adam Smith Institute. I’m sceptical, however, that there is a direct relationship. 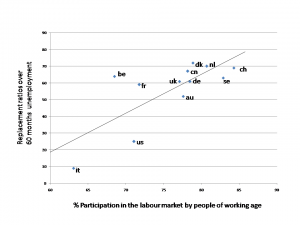 There is no good theoretical reason to suppose that unemployment benefits trump economic and social conditions in determining labour market participation. The Italian Government has proposed the introduction of a European Unemployment Benefit Scheme, applicable to all the members of the Eurozone. The benefit would provide 40% of previous salary for 6-8 months. The purpose of the benefit scheme would be to provide solidarity when countries experience a surge of unemployment; the amount of benefit payable in a country would be limited to 200% of its contribution to the scheme. I suspect the scheme is a non-starter. The Italians have shrewdly put the proposal in a way which is not subject to treaty change or isolated vetoes, but it will be hard to get this past the presumption of subsidiarity. Some of current arrangements within the Eurozone are based on independent and non-governmental arrangements – the Ghent system, based on trades unions, is used in Denmark, Sweden and Finland (see this link by Clasen and Viebrock), and the French scheme, Unédic, is administered by a ‘convention’ of employers and trades unions. The Italian scheme is noteworthy, however, in three ways. It shows that there is still continued interest in promoting the idea of a Social Europe. It reinforces the view that there is now a two-speed Europe, the Eurozone and the rest. And it shows how very far the UK is out of step with the rest of the European Union, both in the objectives and in the level of benefit offered. The Social Security Advisory Committee is consulting on the government’s latest wheeze to cut working-age benefits. This time it’s a proposal to extend the number of waiting days that a benefit is payable, from three days to seven. This will ‘save’ (that is, cut benefit by) £40-50 per claim. Benefits are already paid fortnightly in arrears, so in practice this will mean that people will typically have to wait three weeks for a payment. (The references to ‘days’ and ‘weeks’ are all anomalous, because the government is supposed to be moving to monthly benefits.) Those who are desperate will have to apply for a ‘short term benefit advance’. The policy is due to start in October. The equalities assessment notes that 82% of those affected by the change to Employment and Support Allowance have protected status in terms of the Disability Discrimination Act. Much good may it do them. The Government’s ‘Help to Work’ scheme is introduced today. It will require people who’ve been unemployed for two years to sign on, to go on a six-month community programme, or to get intensive support. The evaluation of the pilot scheme was published in December 2012. It seems to show that the scheme does nothing to get people back to work, but it does claim that the pilots shifted some people off benefits. The statistics are in a different report published a year later; the DWP apparently needed the time to find a way of presenting the numbers so that it would look like something positive had happened. These stats are the source of Esther McVey’s claim that the programme speeded up re-employment by 9 days, not much of a return for a £300m programme. The details are capably summarised, as ever, by Jonathan Portes for the NIESR.